This time of year, many first-time cooks embark upon what should by all rights be a simple task: roasting a turkey. Technically it isn’t difficult, but for some reason many cooks have an imperfect (and in some cases, ruined) turkey because they skipped a crucial step. 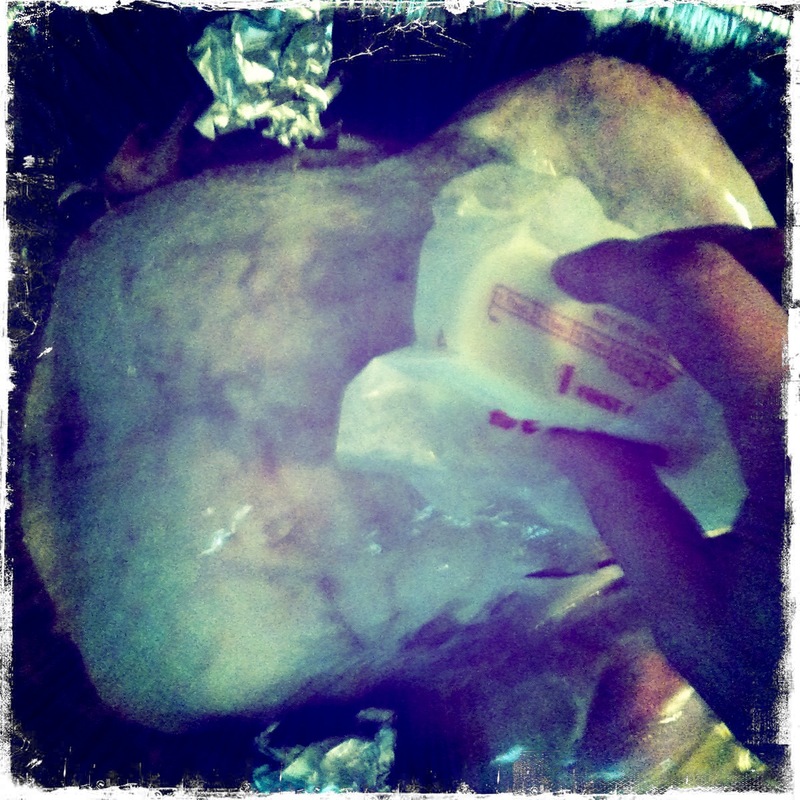 1) Thaw the bird completely. It sounds simple, but you cannot imagine how many holiday meals go south because someone forgot that a 20-lb turkey needs FOUR whole days to thaw. Don’t buy a frozen turkey when it’s on sale the day before Thanksgiving and expect it to be ready to go into the oven in the morning on Thanksgiving Day. This is the No. 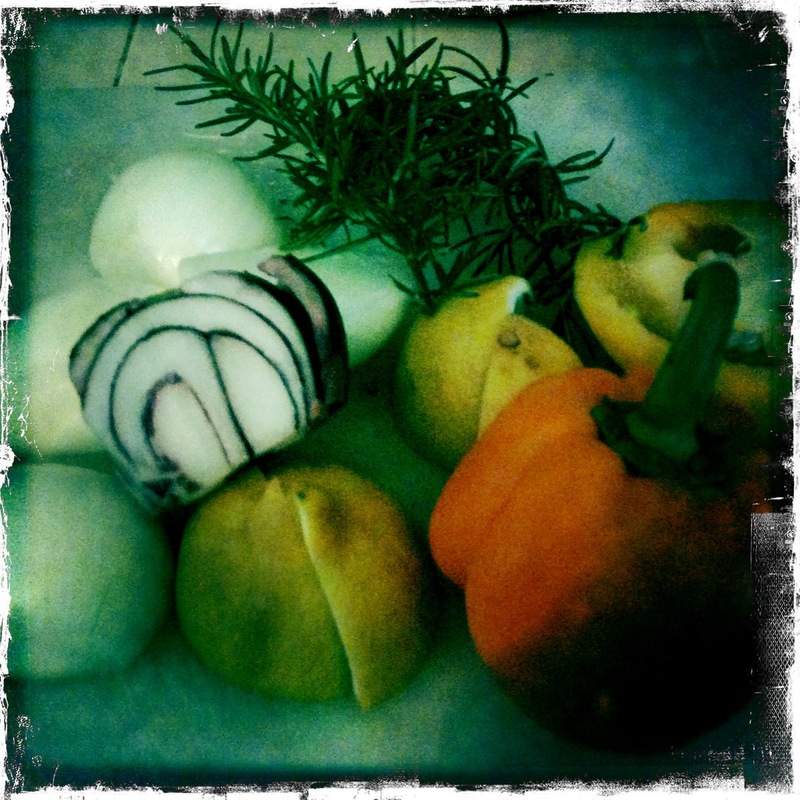 1 mistake new cooks make at Thanksgiving! A general rule is to let the turkey defrost for 24 hours for every 5 pounds. Plan accordingly or the rest of the steps don’t matter! 2) Show that turkey some love. How do you make sure the turkey stays happy for the few hours it’s in the oven? Make sure he’s hydrated. I cook my turkey without the stuffing inside — it cooks faster and is more moist and tender. Instead of stuffing the insides with some sort of delicious dressing (don’t worry, the stuffing has its place at the table, just not inside the turkey), I stuff in two halved lemons, an onion chopped up into chunks (maybe two onions) and a few sprigs of fresh rosemary. I was also doing some pickling that day, so I used a leftover bell pepper as well; my sister adds whole carrots and celery as well. This adds a very light, lemony, herby flavor without overpowering the flavor of the turkey, and keeps the inside and outside of the turkey nice and moist. 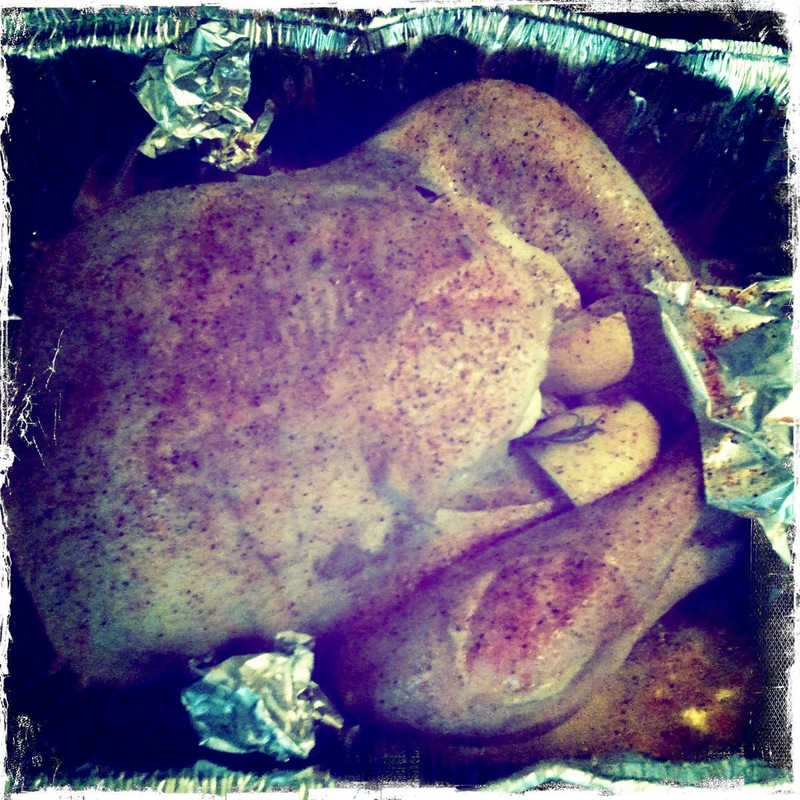 I stuffed the turkey with onions, lemons, rosemary and fresh bell pepper. I also use about a whole stick of butter, both pats of butter inside the cavity with the onions and lemons, and sliding a few under the skin. Make sure to season the outside thoroughly with salt and pepper or your own favorite seasoning blend. Tip: If you really feel like getting crazy, stick a smashed garlic glove under the skin too. You’ll be happy you did. Before putting it in the oven (preheat to 350), place the bird in the roasting pan breast-side up, and make sure to bend the turkey wings under the bird or cover the tips with foil so they don’t burn. Cover the whole thing with foil for the first half of the roasting time, then rub it with a stick of butter (spread it all over, and then put the rest of the butter in the cavity). You may also need to re-apply some more seasoning to the outside at this point. Keep basting the turkey at regular intervals until the internal temperature reaches at least 155-165 degrees in the thigh. For an 18-20-lb, turkey, it will need to be roasted for about 4 1/2 hours at 350 degrees — but note, cooking it to the proper temperature is more important than timing. 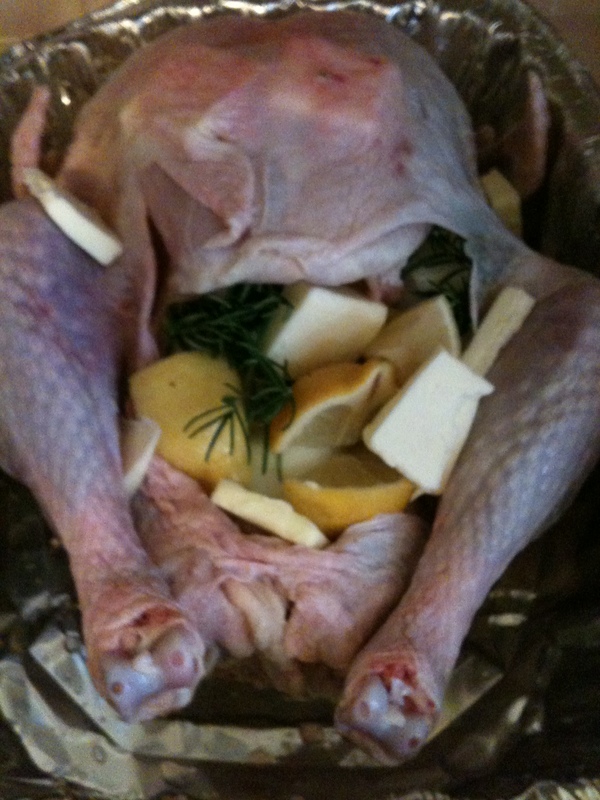 If the thigh of the turkey hasn’t reached at least 155 degrees, keep it in the oven until it does. See more tips here and an easy-to-use chart for roasting times here. Trust me, you will want to get the most out of this tender, delicious turkey. There are a few simple tips for getting the most of that delectable meat off the bones. Check out this great video I found on the New York Times site. This is the best video I have seen on how to carve the turkey to get the most out of each piece. After dinner, it’s not over! When I was growing up, my grandmother would take the liver, gizzard, heart and neckbone from inside the turkey before cooking, and put them in a pot of rice, onions, garlic, and water, on the back of the stove. It simmered all day while the turkey roasted and there would be a lovely bowl of soup for after you get your second wind, an hour or two after pie. 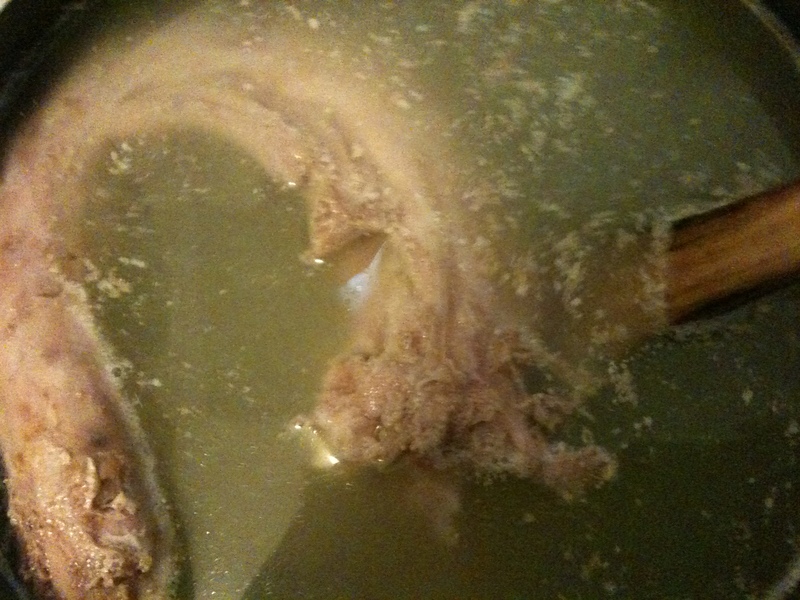 Take the whole carcass if you have a stock pot that’s big enough, or break it apart if you need to fit it in your biggest pot or slow cooker, and cover it with water. If you just want stock to use later, add some salt and pepper only. If you want to make it into a turkey rice soup, add rice and onions and garlic. Let it simmer on low heat (or the low setting on your crock pot) for a few hours, up to overnight, and take out the bones before serving the soup or placing into freezer bags if you’re saving it. You’ll be surprised how much more meat is on those bones! This entry was posted in cooking, food, holidays, Thanksgiving, Uncategorized and tagged herbed turkey, stuffing-free turkey, stuffing-less turkey, Thanksgiving turkey, turkey roasting tips. Bookmark the permalink.